The Kanza Group of the Sierra Club held their annual fundraiser and auction last month. Eric Kirkendall, director of the Diesel Health Project, attended and staffed an information table. Richard Voss, who has been helping the Diesel Health Project by building an Arduino-based particulate matter monitor, displayed that very fascinating device. 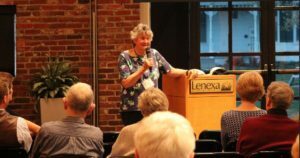 The evening was MC’d by Elaine Giessel, vice-chair of the Kansas Chapter of the Sierra Club. 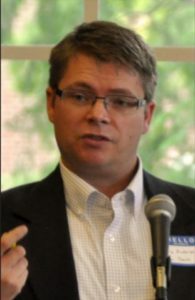 Dr. Christopher J. Anderson, Research Assistant Professor at Iowa State University, and Assistant Director of the Iowa State University Climate Science Program was the guest speaker of the evening. His presentation, “How Kansas Could Benefit from the Paris Climate Agreement” was excellent. He emphasized how implementation of the agreement could substantially slow down the pace of global warming. He said he expects the impact of climate change on the Kansas City area to include increasing temperatures, more heavy rains and an increase in annual precipitation. This was a fun evening, with wonderful food cooked by Sierra Club members, beers and wines from Kansas breweries and wineries, and a huge silent auction that included art, books, items for the home and outdoors, and much much more.